Recently I had a short exchange on twitter on the subject of feminism. Reflecting on the nature of the disagreement, I realized that the structure of the arguments conformed to a pattern I had seen many times before, but never identified. It is a pattern that arises frequently in ideological disputes, I will mnemonically call it the “Straw-Scotsman” pattern. Suppose Alice and Bob are debating about ideology X. Alice is a supporter of X, whereas Bob is a detractor. Bob: I find ideology X unsatisfactory because of its properties a, b, c.
Alice: Ideology X does not in fact have the properties a,b,c that you are wrongly assigning to it. You should inform yourself about what X really is before criticizing it. Bob: You’re just dodging my criticisms by redefining X in a way that suits your argument. It seems to me that whatever criticism one could make of X you would simply reply that the real X is not like that. From Alice’s point of view, Bob is committing the straw man fallacy by attacking a position that does not in fact correspond to X. From Bob’s point of view, Alice is committing the no true scotsman fallacy, by responding to any criticism of X by saying that the real X is not at all like that. I offer no resolution here. From both points of view the opponent is engaging in fallacies, the argument is a stalemate and leads nowhere. The pattern typically also takes the following form when discussing the merits of ideologies in terms of historical outcomes. Alice: Ideology X is flawed, one only needs to look at what happened in the following examples a,b,c where it was applied and led to disastrous results. Bob: I disagree, examples a,b,c only show that the implementation of X was flawed. X was applied incorrectly or not at all, and it is this that led to bad results. However, if one applies X correctly, the results would be satisfactory. Alice: You could always dodge any critcism of a real world case of X by insisting that the implementation was wrong, rather than X is itself faulty. When criticizing opposing ideologies people refer to their real world implementations, whereas when defending their own, they insist on its idealized form. I realize now that I have seen this pattern occur many times when people debate, for example, communism and libertarianism. In mathematics, spectral graph theory is the study of properties of a graph in relationship to the characteristic polynomial, eigenvalues, and eigenvectors of matrices associated to the graph, such as its adjacency matrix or Laplacian matrix. Where each row shows who each voter delegated to. 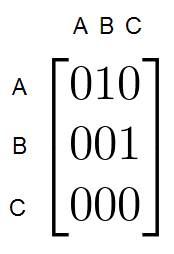 Alice (A) delegated to Bob (B), hence the 1 in the second position of the first row. Similarly, Bob (B) delegated to Charlie, (C) as can be seen in the second row. Because Charlie did not delegate, the third row is all zeroes. This is an eigenvalue equation, whose eigenvector (the (A B C) row vector) corresponds to the result of the liquid tally. Note how the equation is recursive, which fits the recursive nature of transitive delegation. Vote weights are calculated in terms of vote weights themselves, the same way each delegate transmits votes that result from previous delegations. When the adjacency matrix is used to evaluate the importance or influence of nodes in a graph in this way we are speaking of eigenvector centrality. Our example shows that calculating centrality is basically equivalent to tallying in liquid democracy. This is what makes the connection between spectral theory and liquid democracy. Yes, that’s PageRank as in google, in case you thought this whole talk of centrality was a bit abstract, it’s what made google what it is today. 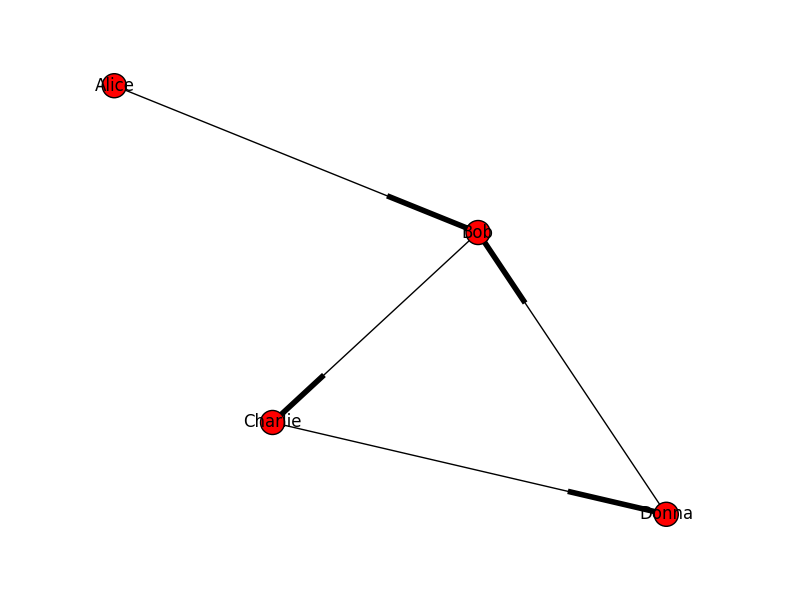 Eigenvector centrality, Katz centrality, and PageRank are related methods to measure the importance of a node in a network. We won’t go into the differences between each measure, besides noting that both Katz and PageRank include an attenuation factor that decreases contributions from distant nodes, whereas eigenvector centrality does not. 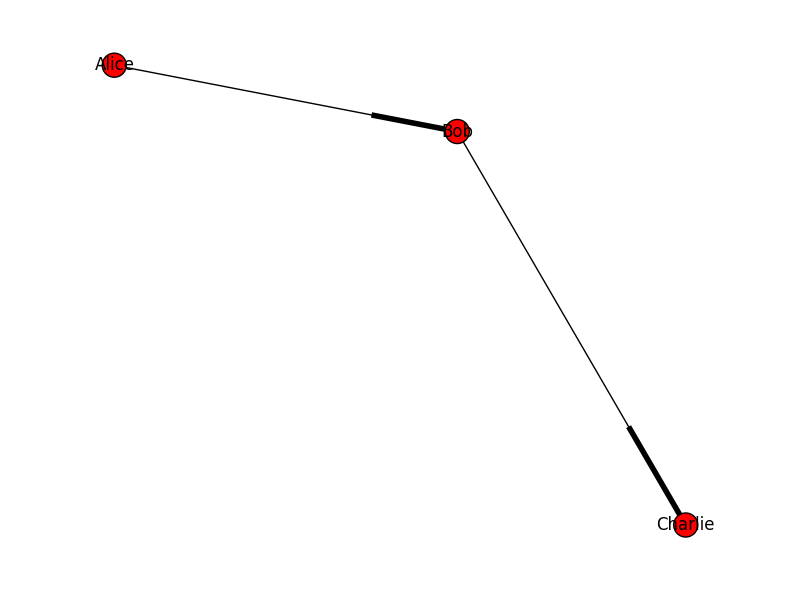 In order to run some examples we will use the networkX library, which includes several functions for calculating centrality as well as many other useful features. If you want to play along with this code you will need to install the library as well as its dependencies, including matplotlib and numpy. If you’re on windows I suggest downloading the comprehensive WinPython package which includes everything you need here. This generated the image shown earlier. Now to calculate the tally, we will run both Katz and PageRank. Both results match the tally we showed before. A couple of minor points above. First, the PageRank result was rescaled to make it match Katz. Second, the adjacency matrix for Katz was reversed as the networkx 1.8.1 Katz implementation is using a right eigenvector (this has been changed to left eigenvector in master). Now Charlie receives 25% of Alice’s vote and 50% of Bob’s vote. So alpha quantifies the fraction of the vote that is effectively delegated. We can interpret then that a liquid democracy tally is a special case of Katz centrality and PageRank. In fact, liquid democracy is the limiting case of Katz and PageRank when alpha = 1.0, ie no damping (which is why you get viscous democracy in [Boldi2011]). One of the first things you have to deal with if you’ve implemented a liquid tallying algorithm is the possibility of cycles in the delegation graph, otherwise the procedure will blow up. Having detected a cycle at tally time the standard treatment is to consider votes that enter it as lost. In order to prevent that undesirable situation you can do cycle detection at vote time to warn the user that his/her vote may produce such a cycle. File "katz.py", line 70, in centrality = nx.pagerank(G, alpha=1.0, max_iter=1000) File "C:\tools\WinPython-64bit-2.7.6.4\python-2.7.6.amd64\lib\site-packages\networkx\algorithms\link_analysis\pagerank_alg.py", line 143, in pagerank 'in %d iterations. '%(i-1)) networkx.exception.NetworkXError: pagerank: power iteration failed to converge in 1000 iterations. networkx.exception.NetworkXError: pagerank: power iteration failed to converge in 1000 iterations. The reason this happens has to do with the details of the algorithm that calculates eigenvectors; in particular the relationship between its convergence and the attenuation factor alpha. The short story is this: using an attenuation factor of 1.0 on a graph with cycles may cause problems. 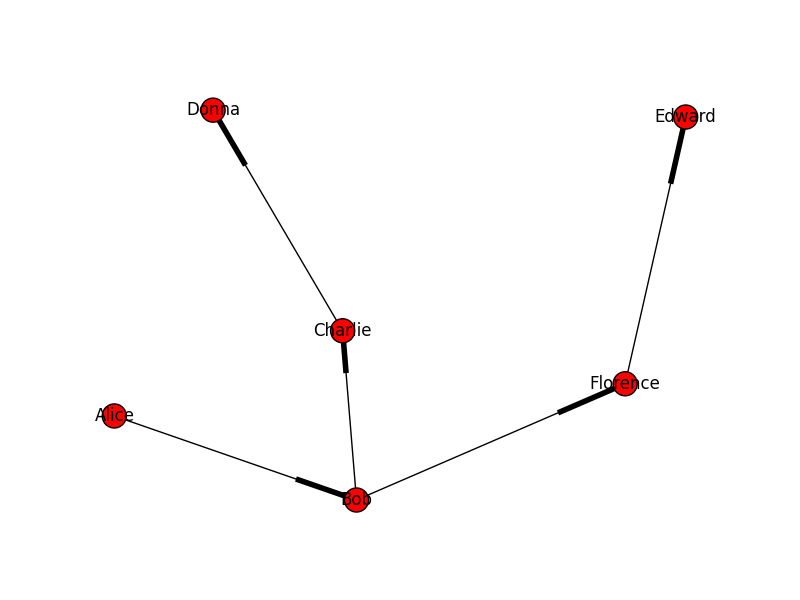 Using this function we can obtain liquid tallies for any delegation graph correctly, using either Katz or PageRank. See the bottom of this post for the full python script demonstrating this. Before we said that liquid democracy is the limiting case of Katz centrality and PageRank when alpha = 1.0. In the last section we saw another requirement besides that of alpha = 1.0: that the delegation graph must be acyclic, in other words a DAG. There is one more property that we can consider, degree. A node’s degree is the number of (in our case, outward) connections with other nodes. In terms of delegation, it is the number of delegates that a voter chooses. Standard liquid democracy uses degree = 1, but such a requirement could in theory be relaxed. How does this fit in with Katz and PageRank? Lets construct a graph where voters may choose one or two delegates. We see how Katz centrality does not yield a correct tally as it is not dividing outgoing weights for voters who split their delegation among two delegates, instead we get inflated weights. But the PageRank result does work, Bob’s two votes are split correctly, and the delegation proceeds normally from then on. That’s it for our quick tour of the relationship between liquid democracy and spectral theory. We have also seen how liquid democracy could be extended to include damping (as in [Boldi2011]), or to allow “multi delegation”. For simplicity, I have ignored the initial weights associated with each voter in the matrix equation. These initial weights are what makes liquid tallying equivalent to undamped Katz centrality rather than eigenvector centrality. For details as to alpha and PageRank See http://vigna.di.unimi.it/ftp/papers/PageRankFunctional.pdf section 5 Limit behaviour.